For several years, I've marveled at how Berlin has eclipsed Munich in urban energy. It seems to be comfortable just being itself rather than trying to keep up with the capital of Germany. It's a city that respects its past while looking energetically into the future. Despite its population of 1.5 million, Munich (or "München," as it's called in German) feels small. This big-city elegance is possible because of its determination to be pedestrian- and bike-friendly, and because of a law that no building can be taller than the church spires. There's ongoing debate about changing this policy, but there are still no skyscrapers in downtown Munich. Tourists love Munich. Legions of young expat tour guides are in a brutal battle for the tourist dollar. Here in the beer capital of Europe, tours start late — giving backpackers a chance to sober up. Feisty small walking- and biking-tour companies train guides who end up splitting off and freelancing — offering tours for free and just asking for tips at the end of the gig. 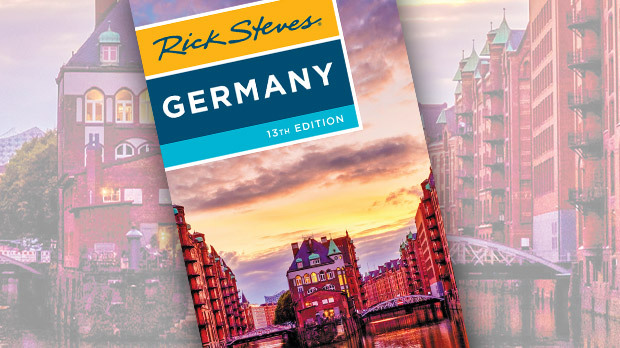 In general, the guides dumb down their lectures with lots of silly legends, and refer to the beloved Frauenkirche as the "church with the Pamela Anderson domes." But they are introducing many visitors to a facet of Bavarian culture beyond its famed beer. 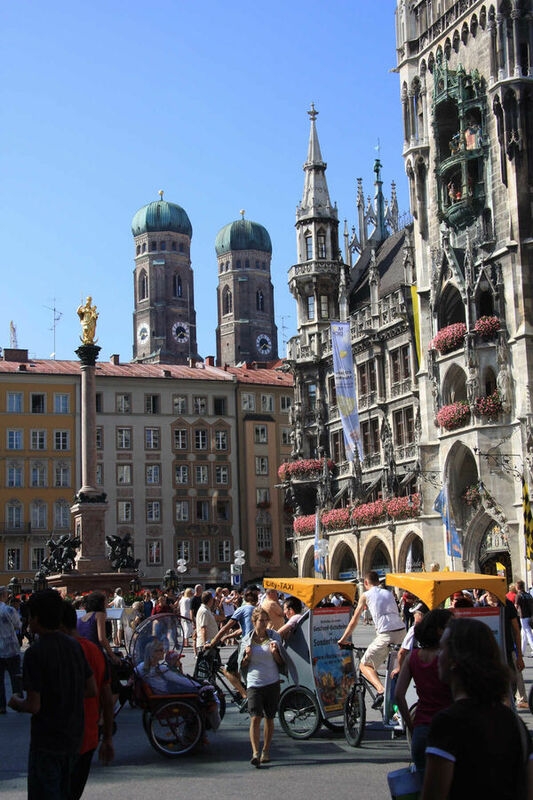 Most of these tours start in the sunlit main square called Marienplatz ("Mary's Square"), which gives you a fine look at the glory of Munich. I love to take in the ornate facades of the gray, pointy Old Town Hall and the Neo-Gothic New Town Hall, with its beloved glockenspiel — only 100 years old — that re-creates a royal wedding from the 16th century. At outdoor cafés, people linger like the birds and breeze with which they share this square. The oldest church in town, St. Peter's, is a few steps from Marienplatz. Along with much of Munich, it was badly damaged in World War II. As part of the soul of the city (according to a popular song, "Munich is not Munich without St. Peter's"), the church was lovingly rebuilt — half with Augustiner beer money, the rest with private donations — and the altar and ceiling frescoes were marvelously restored. After the war, people who lived in Germany's heavily bombed cities debated how they'd rebuild. Should they reconstruct the old towns, or bulldoze and start over from scratch? Frankfurt voted to go modern (and is today nicknamed "Germany's Manhattan"), but the people of Munich rebuilt their old town center. City leaders took care to preserve Munich's original street plan and re-create the medieval steeples, Neo-Gothic facades, and Neoclassical buildings. They blocked off the city center to cars, built the people-friendly U-Bahn (subway) system, and opened up Europe's first pedestrian-only zone (Kaufingerstrasse and Neuhauser Strasse). Only now, 65 years after the last bombs fell, are the restorations finally being wrapped up. Just behind the rebuilt St. Peter's, you can experience small-town Munich at the Viktualienmarkt, long a favorite with locals for fresh produce and friendly service. While this most expensive real estate in town could have been overrun by fast food places, Munich keeps the rent low so these old-time shops can carry on. 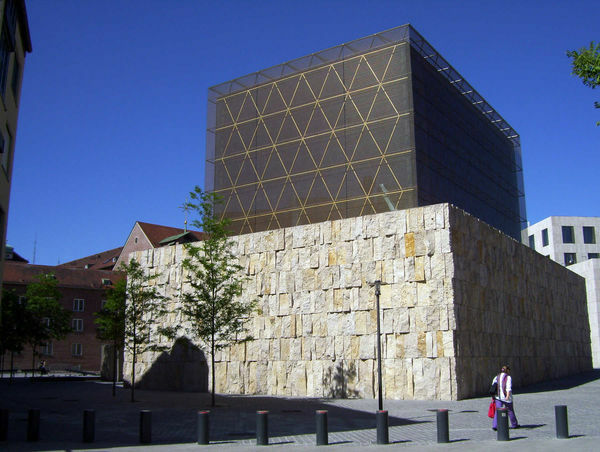 A few blocks away, Munich's remarkable new synagogue is off-limits to the public, but it's worth a look for its powerful exterior — its lower stones are travertine, like Jerusalem's famous Wailing Wall. Because Germany accepted religious exiles from the former Soviet Union, today's Jewish population in Munich has finally reached pre-Nazi levels — 10,000. Wherever you walk, you'll see the twin onion domes of the Frauenkirche, the city's iconic church. Some say Crusaders, inspired by the Dome of the Rock in Jerusalem, brought home the idea. Others say these domes are the inspiration for the characteristic domed church spires marking villages throughout Bavaria. Although much of the church was destroyed during World War II, the towers survived, and the rest has been gloriously restored. Inside, look for a plaque over the last pew on the left that recalls the life story of Joseph Ratzinger. He occupied the archbishop's seat in this very church from 1977 until 1982, when he moved into the Vatican, and ultimately became Pope Benedict XVI. Walking through Munich, you'll understand why it is consistently voted one of Germany's most livable cities — safe, clean, cultured, a university town, built on a human scale, and close to the beauties of nature. Though it's the capital of Bavaria and a major metropolis, Munich's low-key atmosphere has led Germans to dub it "Millionendorf" — the "village of a million people."